I am refreshed and impressed. That makes you doubly irrepressible. So was I with that tiny fly. Growing between an overpass and feeder road near me is a plant with many sunny blooms that may or may not be a Maximilian. I have enjoyed it as I passed by the last few months. We’ll see if it survives the mowers. I was fortunate that the sunflower with the tiny fly on it had survived the mowing it got. Naturally I hope your luck is as good. It’s not clear if the location you described as being between an overpass and feeder road is accessible to you or if walking over to the sunflower is too dangerous. (I’ve sometimes waited for a lull in traffic to zip across a feeder road to reach a plant of interest.) If you can get a closer look, even with binoculars, you may be able to see whether “your” sunflower has the characteristic narrow leaves of the Maximilian, which fold up along the midline and curl generally downward as a whole. It is dangerous and definitely a drive-by. But, it is bright and beautiful in an ugly place. It sounds like even parking nearby to have a look with binoculars would be difficult. At least you can enjoy the beautification as you drive by. In recent years I’ve noticed plenty of wildflowers (especially sunflowers) growing in the median of Mopac, inaccessible but a pleasure to observe even at highway speed. Did the 2nd plant get hit with a frost, but it’s still alive? Is that common, for such a dead-looking plant, to bloom? Anyways, I’m happy to see such a bright yellow flower. 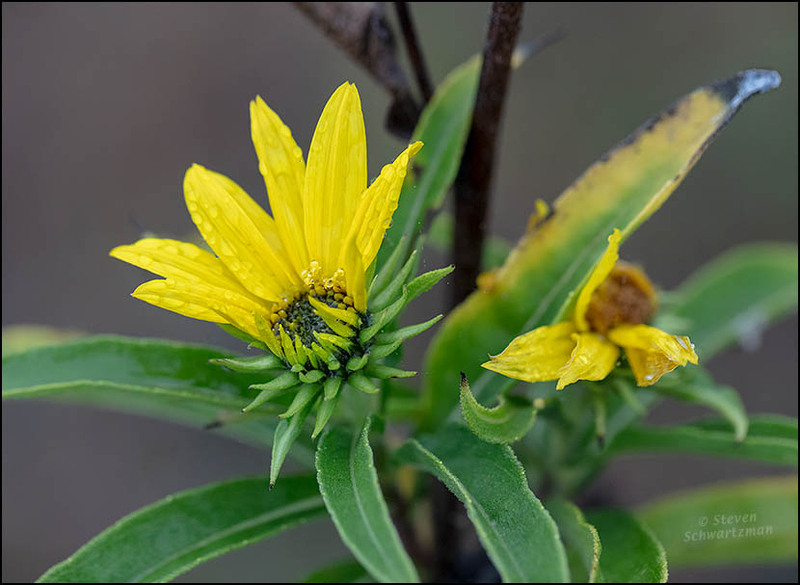 I, too, wondered whether the leaves of the plant in the second picture were darkened due to frost, but some of the adjacent Maximilian sunflower plants, like the one in the first photo, had green leaves, even though they would’ve been hit by the same presumed frost. In addition, the leaves in the second picture look like the ones I often see on plants of this species and that attribute to natural aging. In any case, as you say, the contrast with the yellow flowers makes for a happy sight. I wonder if the heat island effect I mentioned in my previous comment was responsible for this flowering. I always enjoy examples of the persistence wildflowers show. 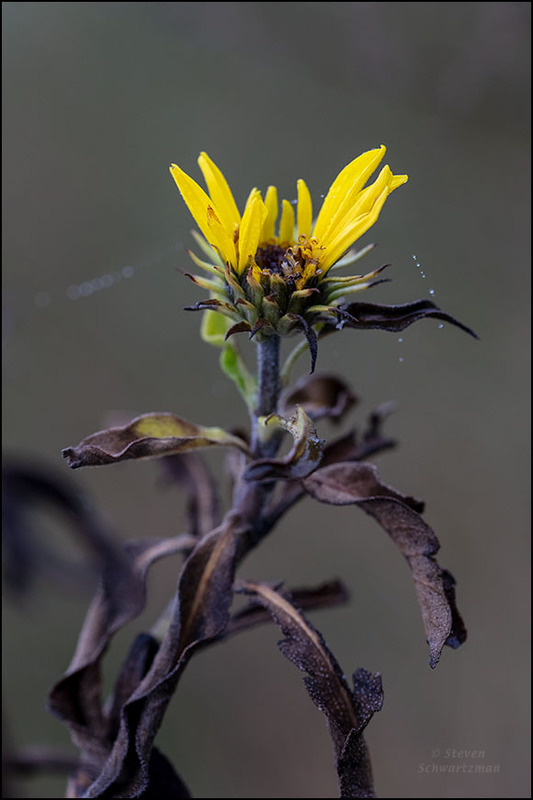 On a recent trip to the Brazoria refuge, an entire colony of camphor weed (Rayjacksonia phyllocephala) had been blackened by what I assumed to be cold temperatures and perhaps frost, but they were happily blooming despite the insult. I especially like the contrast in the second photo, and the bits of dewy silk. It was indeed the contrast between the dark leaves and the bright flowers that I wanted to highlight in the second picture. As you read in the text, this location is adjacent to the intersection of two expressways. Even so, the land in this quadrant is low and often wet or damp, and warm air rises, so it’s not clear how much extra heat makes it down from the cars and concrete. Someone at the NPSoT meeting on February 19th reported seeing Maximilian sunflowers but I don’t know in what sort of environment. Okay, that would be weird even here. Is ‘Maximilian’ the one that is the state flower of Kansas, or is the variety just not specified? seems to imply Helianthus annuus, the common sunflower, but there’s nothing specific (in the sense of specifying the species) in the wording. Yes, I have heard that before, in all regards. Some say that ‘Maximilian’ is it. Others say it is not specified. Others specify any random variety that they happen to like, even though it was not invented when sunflower was designated at the State Flower. It happens with other state flowers and trees too. California is supposed to be the only state with two state trees, because both the coastal redwood and the giant redwood were designated as such. Actually, there was NO distinction between the two because giant redwood was known only to the botanists who were just learning about it at the time. Right, and you’ve heard me say that all five of the Lupinus species that grow in Texas are considered the state wildflower. That is just weird. Although, we humans haven’t been looking closely at native flowers for all that long. I wonder if they’ve been behaving this way all along, and nobody noticed. You raise the right question. In my two decades of looking at native plants I’ve now and then come across prodigies (i.e. blooming before their usual time) and lingerers (blooming after their usual time). Occasionally, as with these Maximilian sunflowers, I’ve found a species flowering half a year out of its usual time, so it’s hard to tell whether the plant is blooming early or late. In any case, some plants are and presumably have always been opportunistic. Determining whether the occurrence of out-of-season flowers is increasing would take dedicated observation and record keeping rather than anecdotal reports. It would and I imagine it will. In our area there are lots and lots of new environmental scientists being minted every year. I just went to a program by a scientist I used to work with at Illinois Beach State Park. In this program he was discussing the changes he has observed over 30 years of study at Moraine Hills. The news was surprisingly good~C value has increased at the 4 sites he studied. There has been a dramatic increase in tree density, however, which has shifted ecosystems from prairie through savanna toward forest. It was cool to learn the results of this long-term study. I’m not familiar with C-value: what does it measure? It stands for Conservation value. When referring to a plot of land, it is a measure of the quality of a site. For example, sometimes we’ll come across a patch of original prairie that has never seen a plow or been grazed. It will have a suite of high quality plants present, and no weeds, and so will have the highest c-value. If it is referring to a specific plant, it measures how representative a plant is of high quality ecosystem. There is a more elegant way of wording that but I can’t quite remember the word. So, for example, a plant like a prairie fringed orchid will only grow in a very high quality site that is not contaminated by pollution, etc, or over run by weeds, and is rare even there, so it will have a C value of 10. It is handy as far as it goes, but you can imagine the problems it creates. For one thing, we often strive to remove exotics and return species that have been lost. And then certain biologists sniff and say it is only a restoration habitat and will never be high quality. Thanks for your explanation. I see the difficulties. It is a pleasure. There are few people I can really talk with about scientific matters~it feels good to stretch my mind. You might say the mind is a good place to leave stretch marks. Better than elsewhere, that’s for sure. Okay, now sunflowers seem more Texas than icicles. And once again you have me yearning for spring. No question about sunflowers being more typical of Texas than icicles. It’s 73° here at 9 in the evening. The drops are lovely, so are those bright yellows. 73° in the evening! The snow is a foot deep in my yard, though it is melting and 40° today. Six of one, half a dozen of the other (sort of): you get ice crystals, we get wildflowers. Under sunny skies it’s 74° in Austin now with a predicted high of 85°: no ice here except in our freezer. That bee fly photo was the first time I’d viewed your blog, early 2012 when I was first exploring WP. It is still one of the most amazing captures of a little guy that I’ve seen to date. Such a pretty and friendly little fly it was, apparently not bothered at all by my presence. Yes, it was a long time ago that you came across it, 7 years. I’m glad we’ve been acquainted that long. The Maximilian Sunflower prefers to be unpredictable. I’ve noticed that some species are that way, while others have proved more predictable. For example, I’ve never seen prickly pear cactus flowers outside their usual season. Nor have I. But there is always a first time!